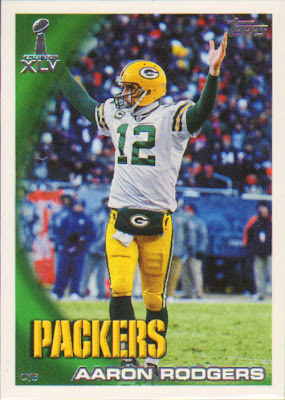 Well after a whirlwind 2 weeks in the lower 48 I'm back at work and it's snowing in April. 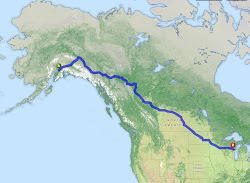 Ah Alaska. 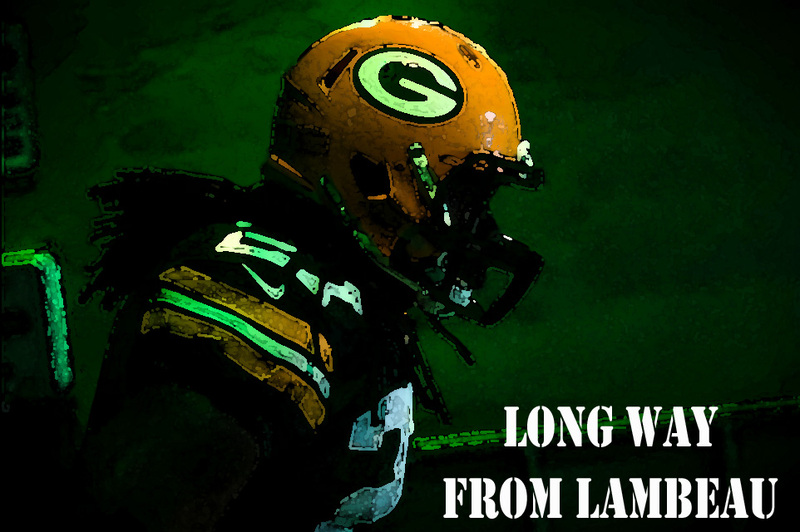 I had such a good trip got to go to Lambeau for lunch and a tour to start the vacation and ended the vacation with a baseball game at Wrigley Field. 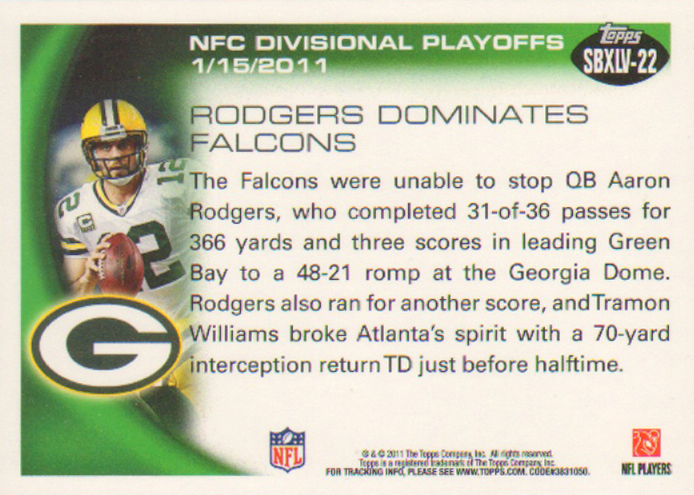 Both of which I plan to post about over at Collector's Crack. 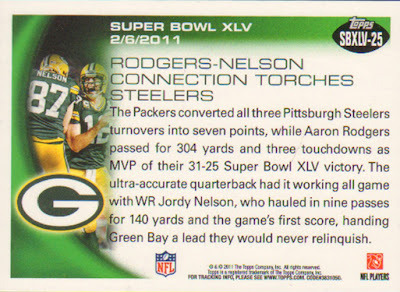 But while at Lambeau I visited the gift shop which was a bit overwhelming. 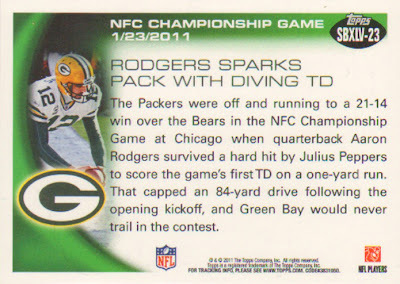 Having not lived in Wisconsin for over 13 years the pure variety Packer stuff was incredible. I was very good I got out of the store for under 30 bucks. 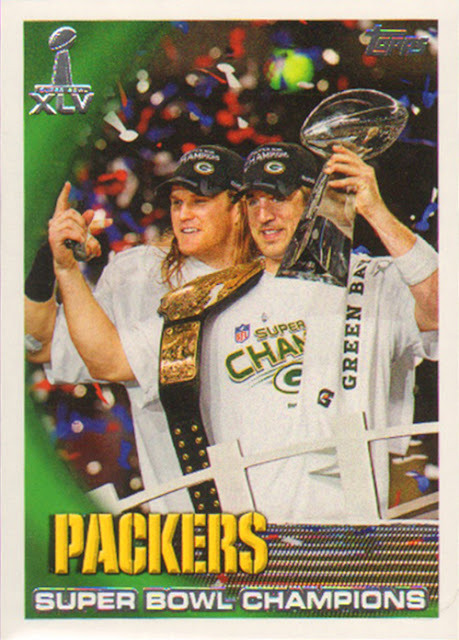 I bought a very nice Super Bowl pennant. 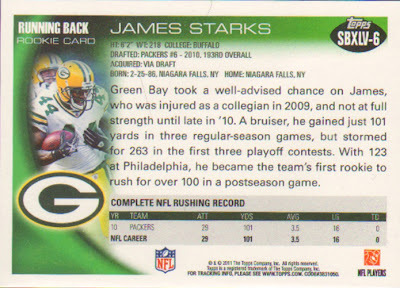 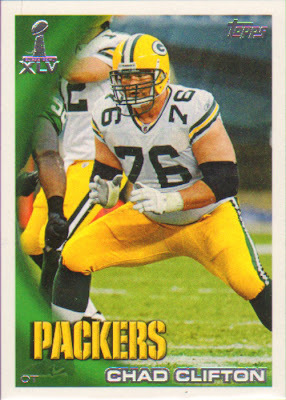 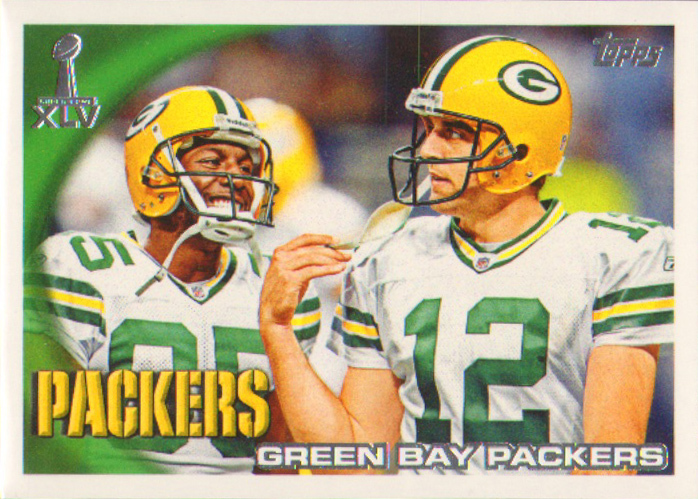 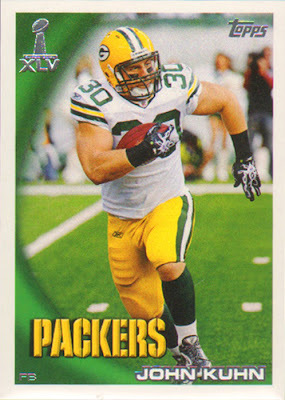 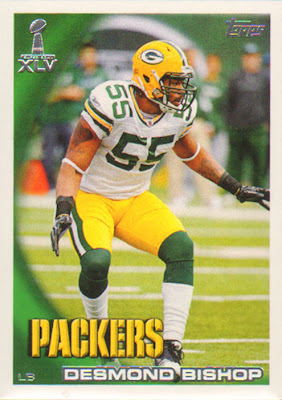 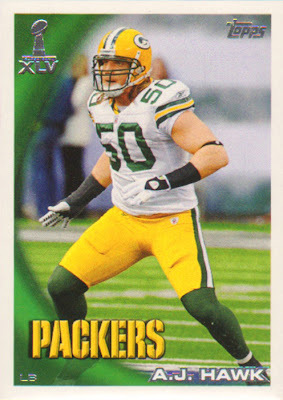 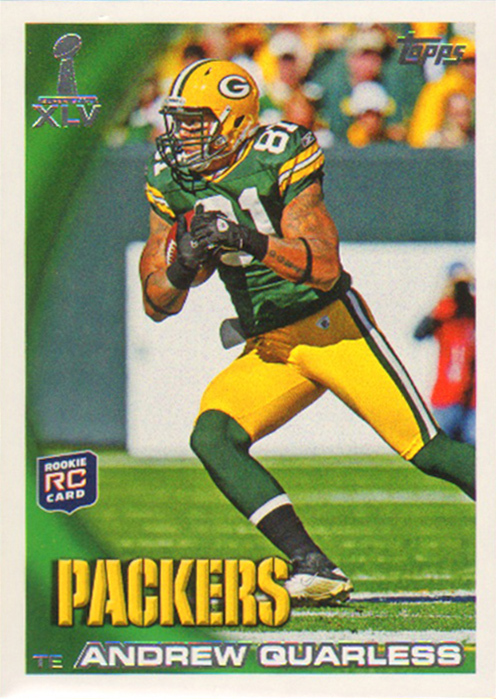 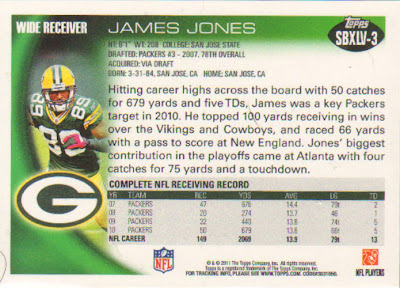 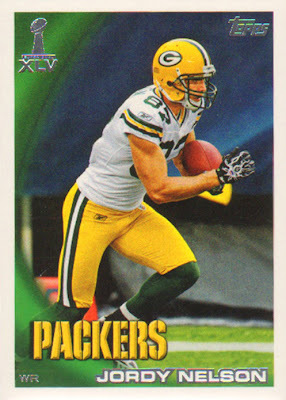 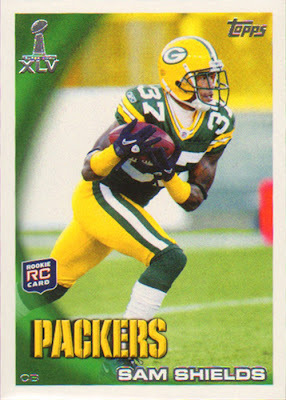 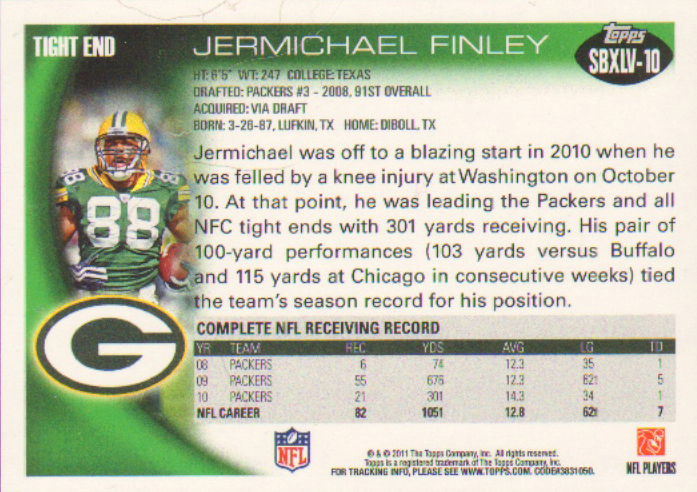 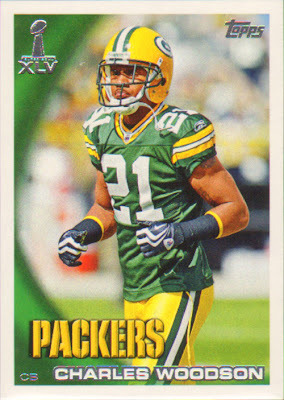 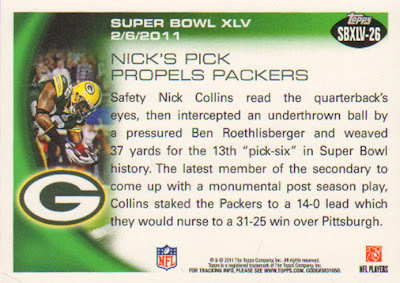 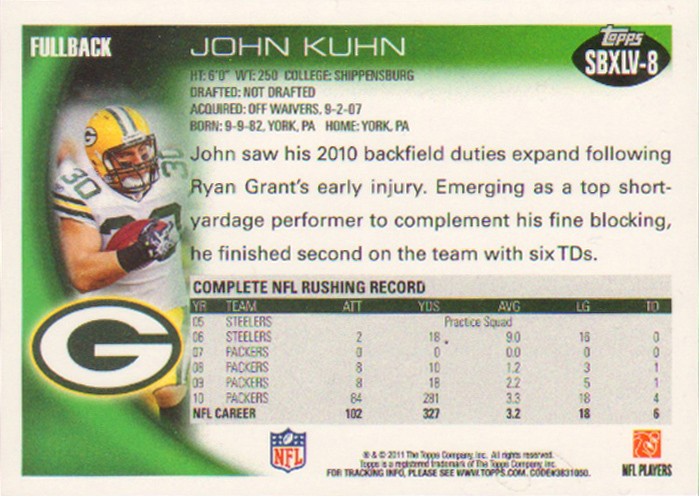 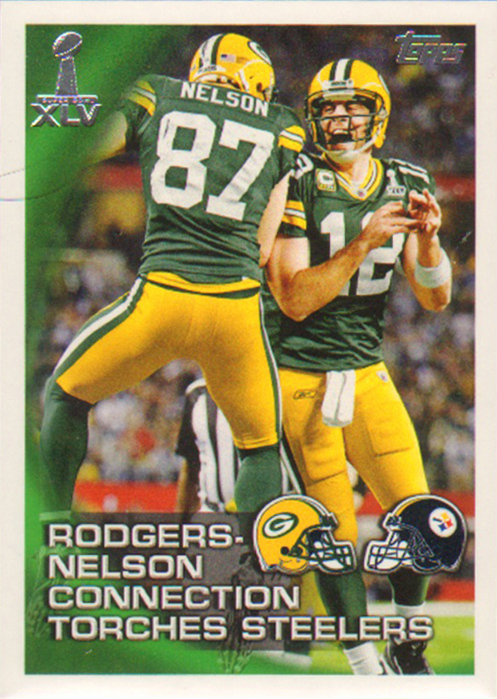 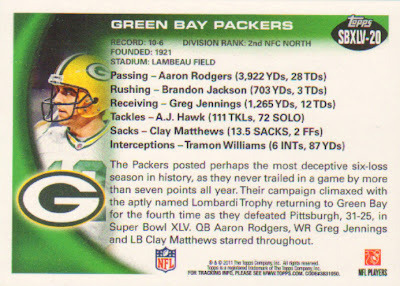 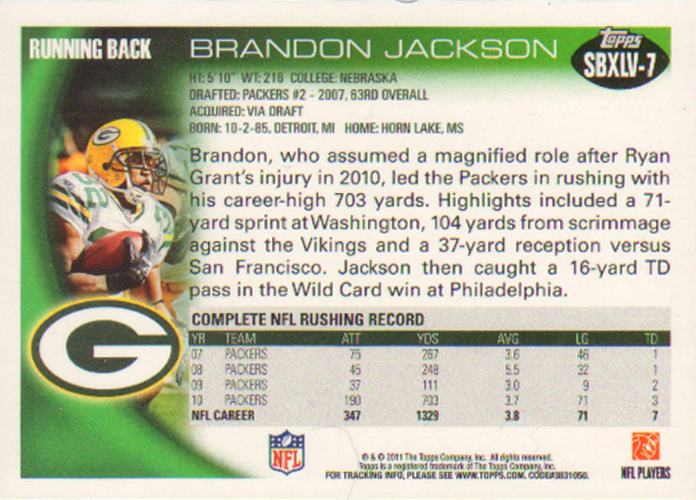 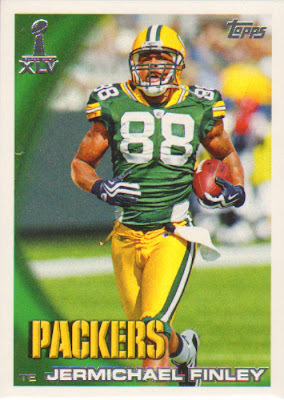 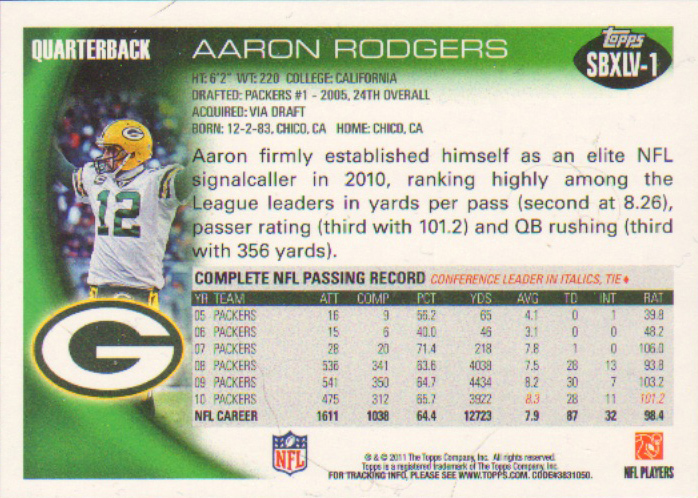 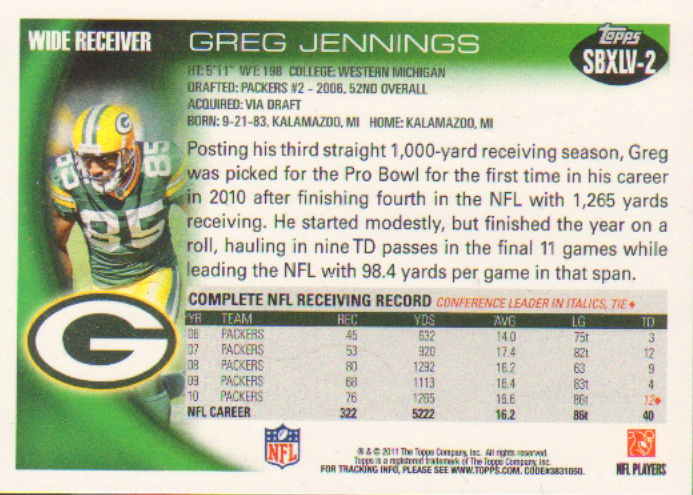 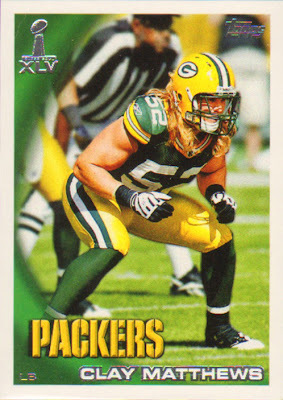 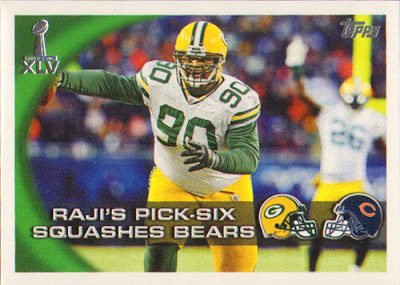 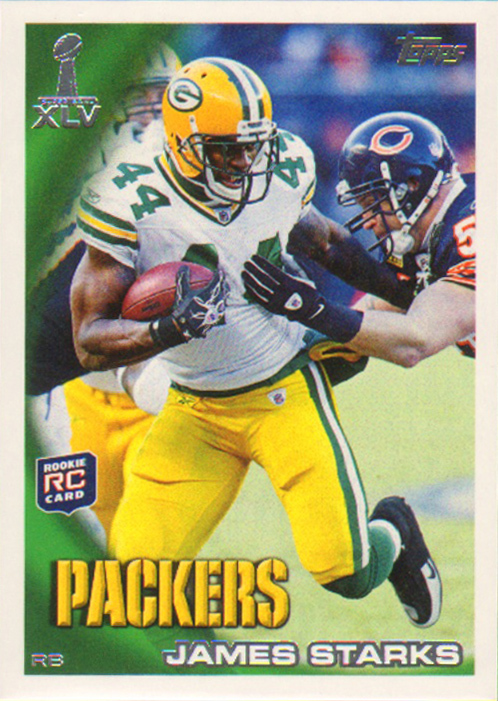 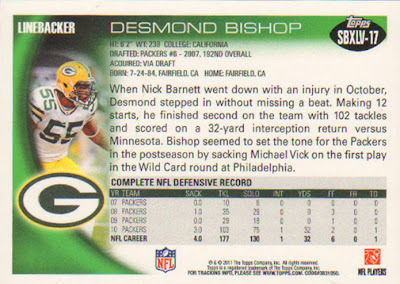 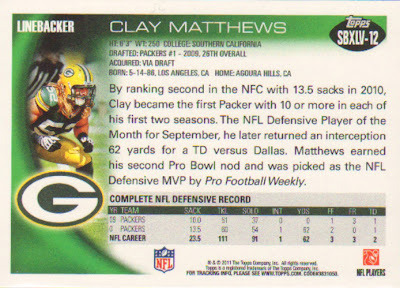 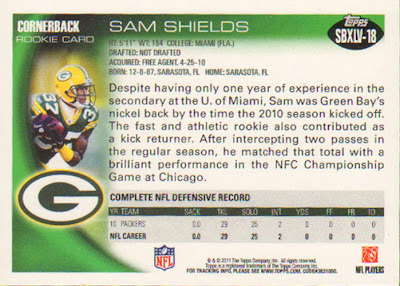 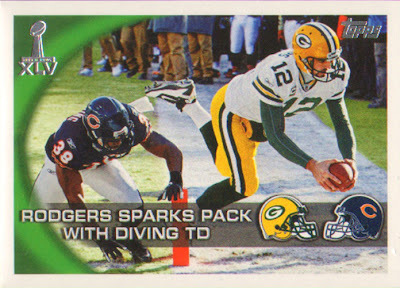 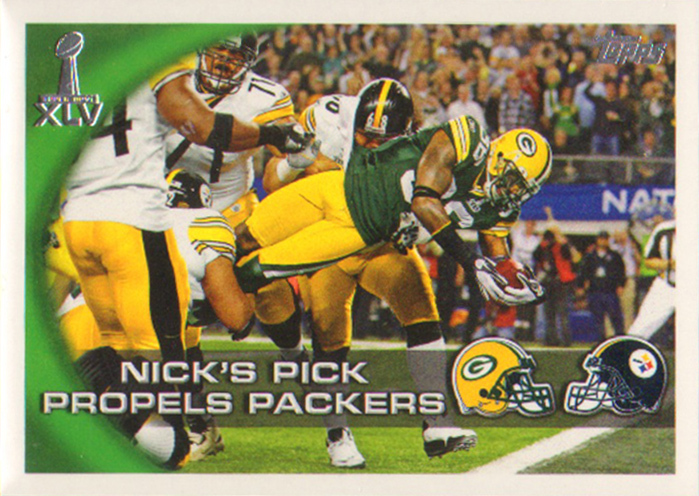 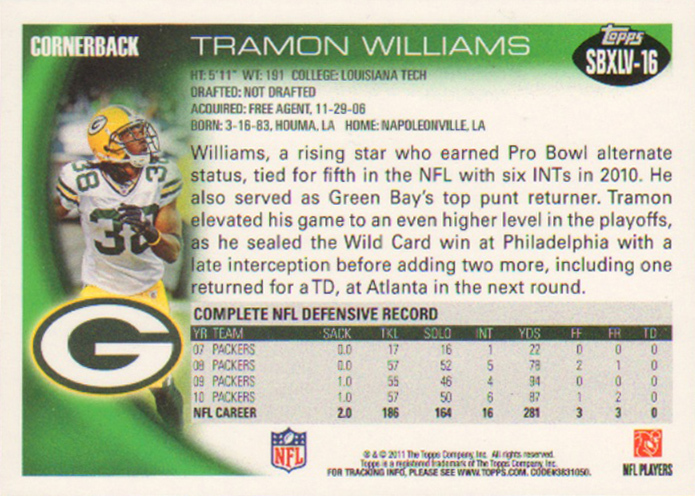 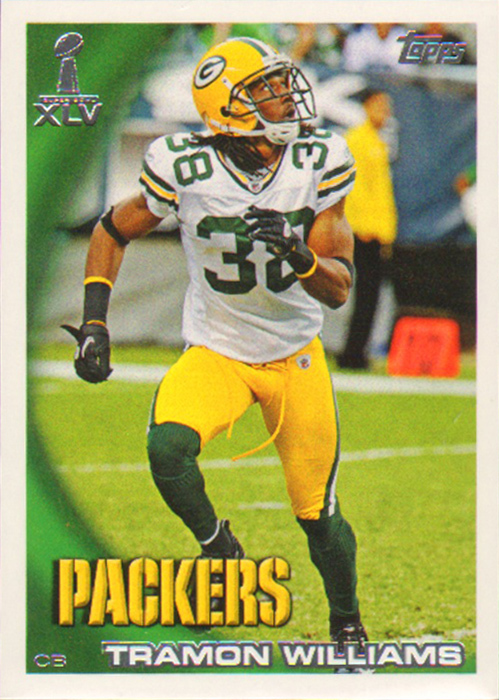 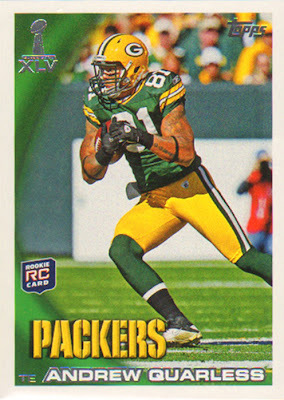 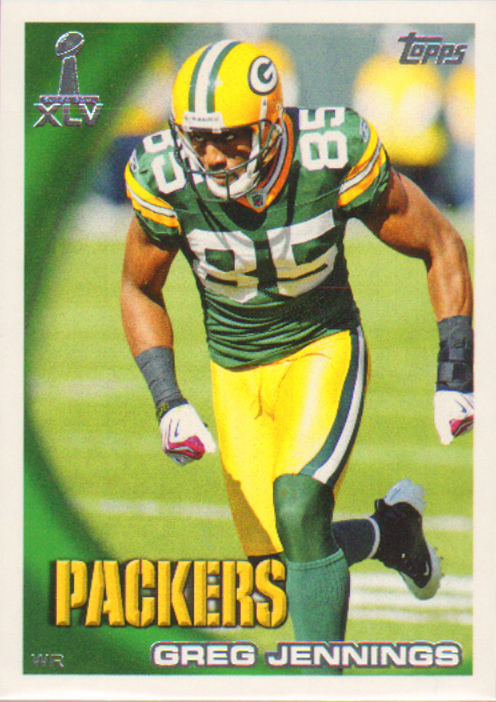 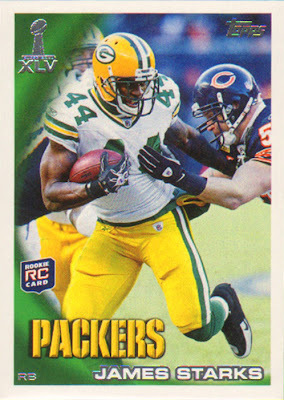 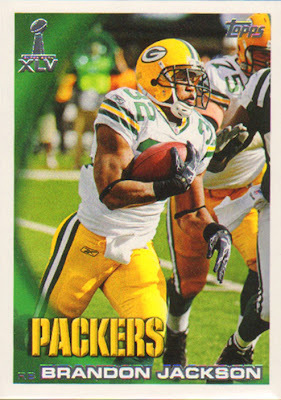 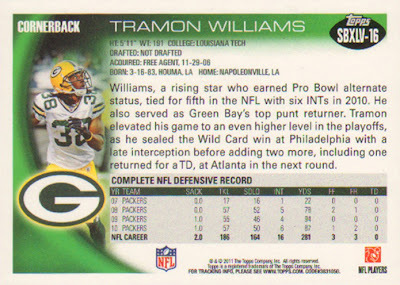 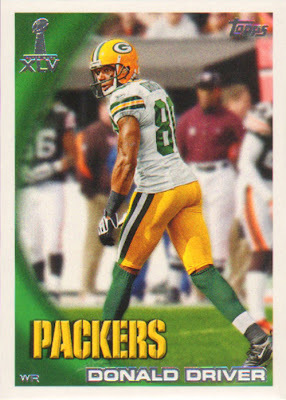 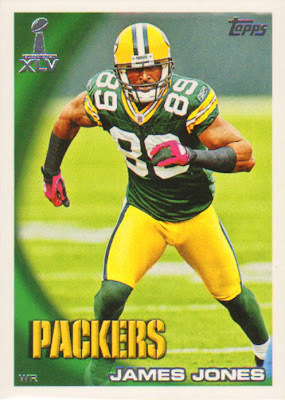 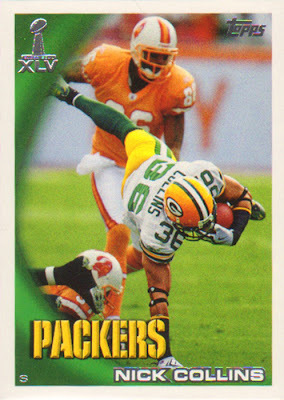 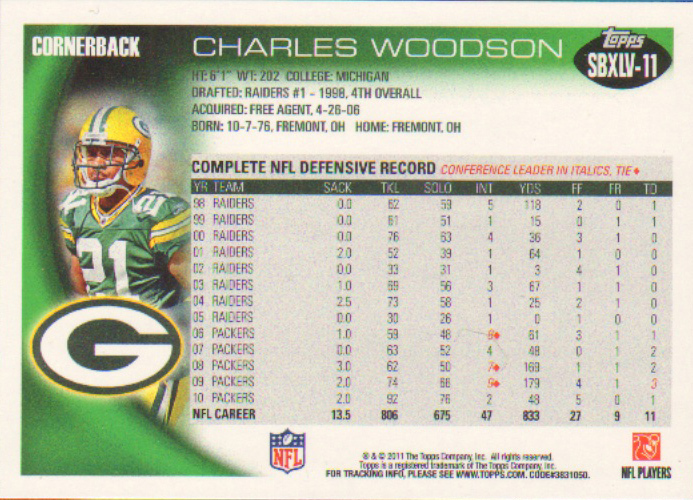 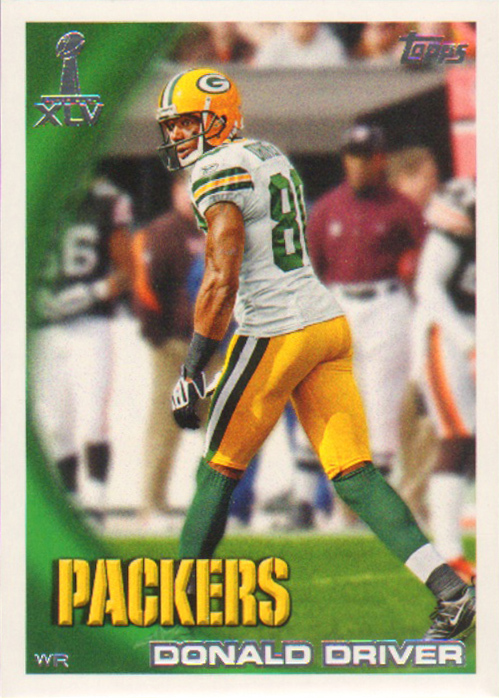 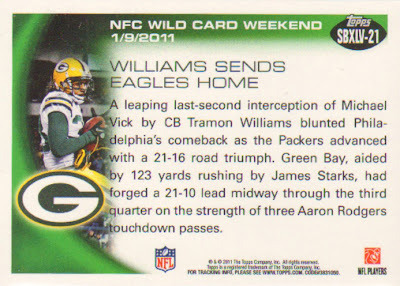 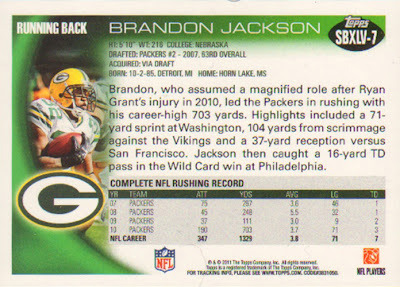 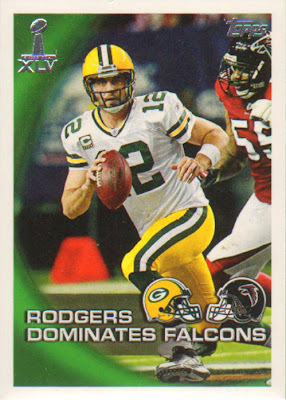 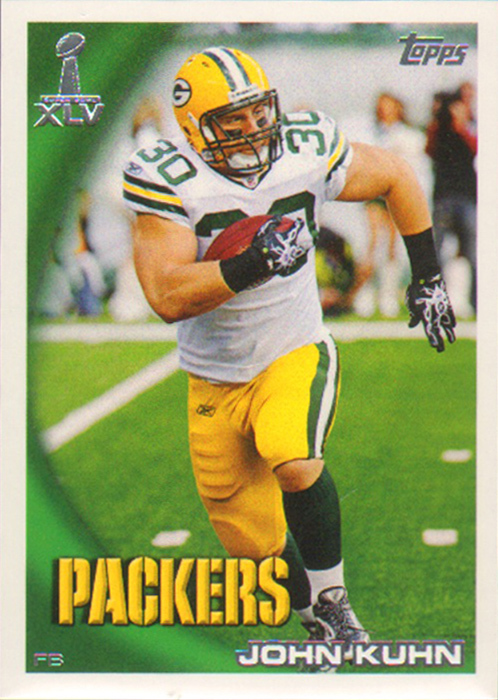 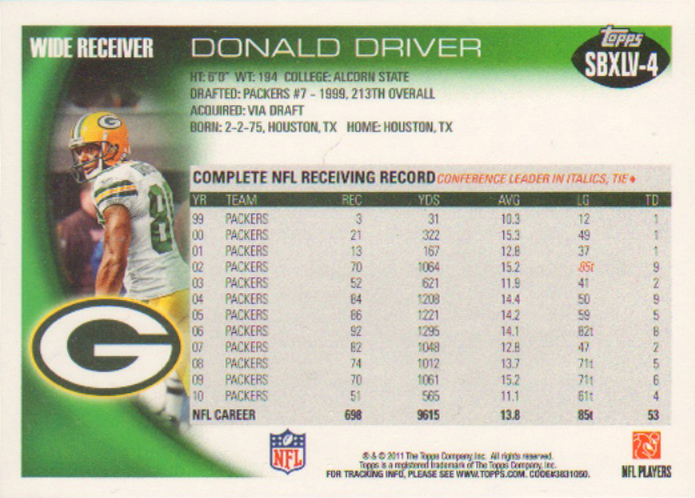 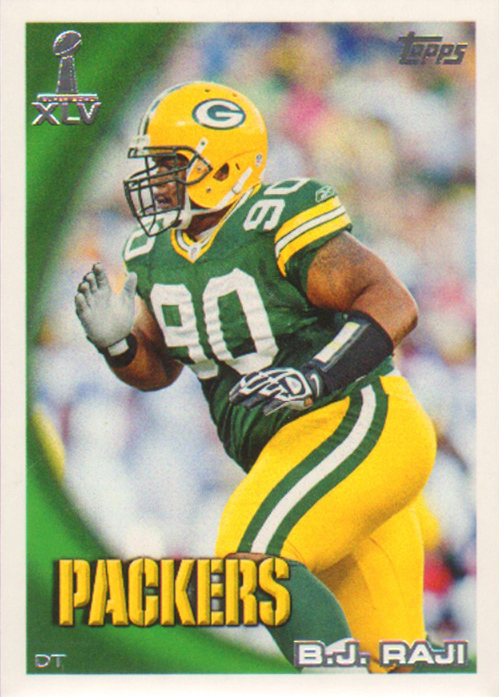 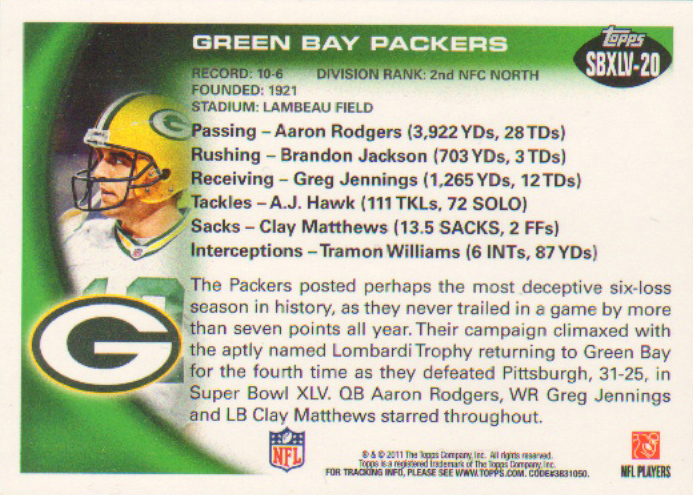 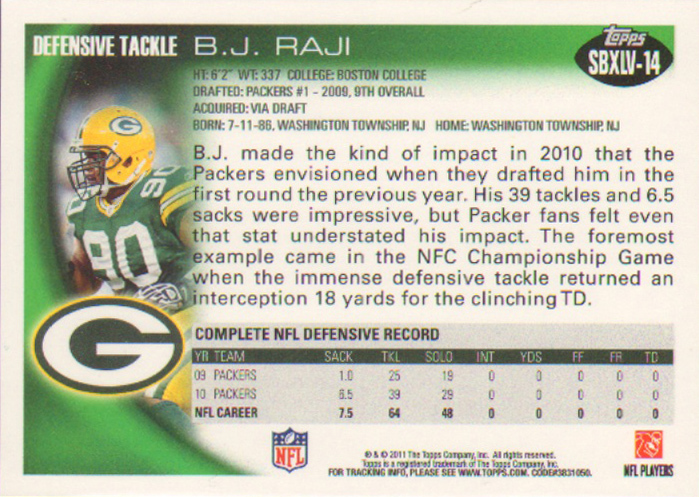 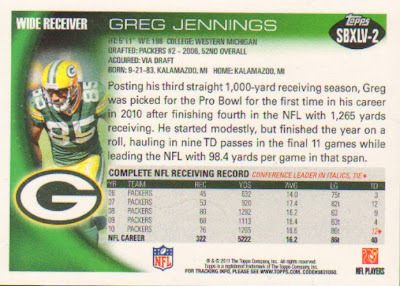 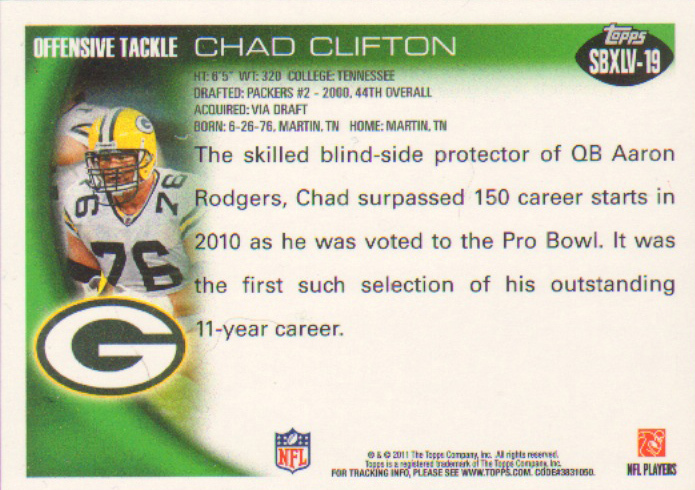 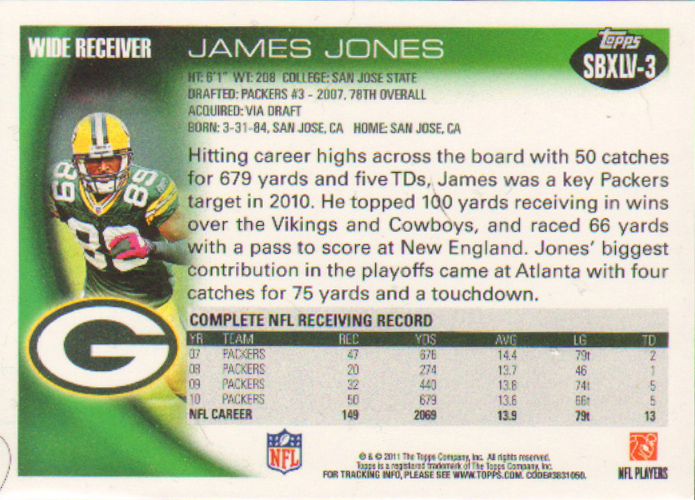 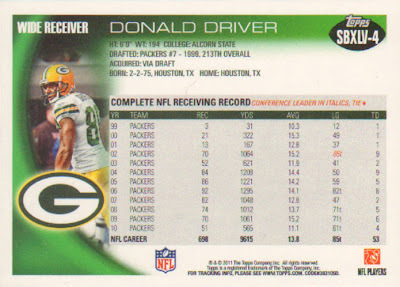 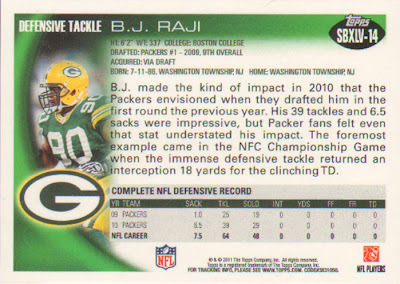 I also picked up the Topps Super Bowl XLV Packers set. 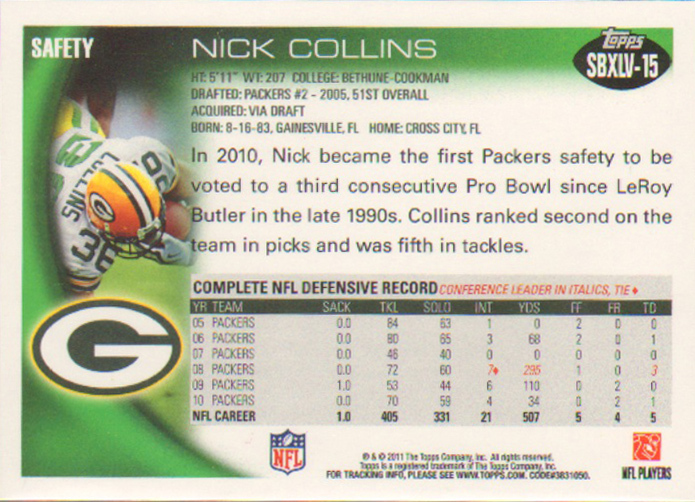 I had been looking online and found the price with shipping to be outrageous and my local LCS had sets for 12 bucks and I was probably going to pick one up when I came back but I saw the sets at the Packers Pro Shop for under 10 bucks so I picked it up. Matt over at Heartbreaking cards has already posted the checklist. 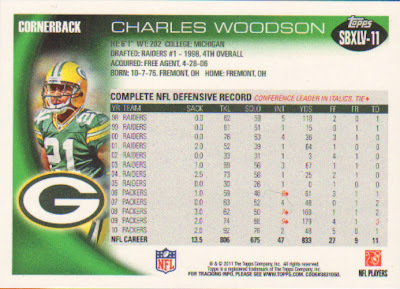 But here is the full set in pictures with backs. 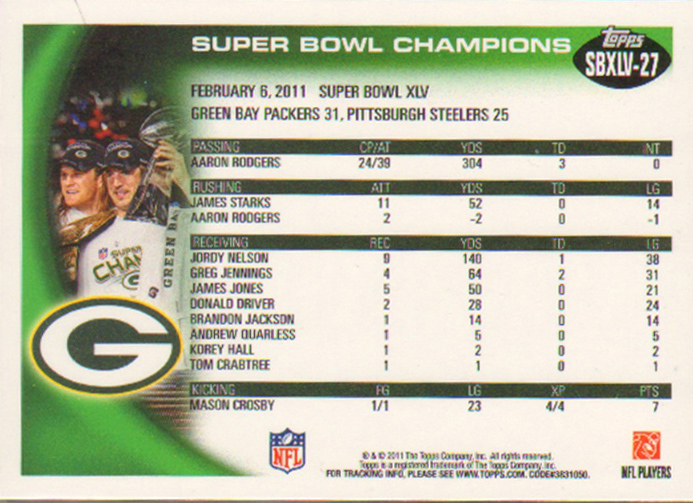 There you have it the full 27 card set. I like that Topps did a 27 card set as it all fits nicely into three 9 pocket pages. This is an awesome set... I agree that Topps had the right idea about creating a 27 card set... to fit into the three binder pages.